Office Space - Shelburne, Vermont. 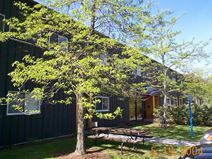 Set in prestigious Shelburne just off I-89, these beautifully designed executive offices are available to lease in a variety of sizes for a tailored workplace. Virtual office services are also available for individualized options and convenience. Each office to rent is fully furnished and equipped with the latest technology and benefits from an abundance of natural daylight. Burlington International Airport and a huge range of shops and restaurants are easily accessible.